Since early October, 133 politically motivated attacks were reportedly perpetrated by supporters of Brazil’s far-right presidential front-runner Jair Bolsonaro. The numbers were gathered on a map released Tuesday by the web portals Opera Mundi, Outras Palavras, and De olho nos ruralistas. The survey started a week before the first round of Brazil’s elections, which were held on Oct. 7, and has recorded eight deaths, 42 assaults, 21 incidents where the attackers used weapons, and 17 cases of Nazi graffiti ever since. Six of the victims were transgender people and nine attacks targeted journalists. The editor of the De olho nos ruralistas portal, Alceu Castilho said the map only shows part of the problem, as many cases are not reported. “This is a warning sign. If we have a Bolsonaro administration, minorities will be the main people impacted,” the journalist said. He pointed out that violent crime in rural areas is probably an even bigger problem, mentioning the case of a person who was threatened by Bolsonaro supporters simply for being an indigenous person, while he was not wearing anything to support the far-right candidate’s rival party in the runoff vote, the Workers’ Party (PT). The editor of Ópera Mundi, Antonio Martins, pointed out the map is a powerful response to the escalating violence, as are the demonstrations across the country. “We have to be prepared to resist,” he said. 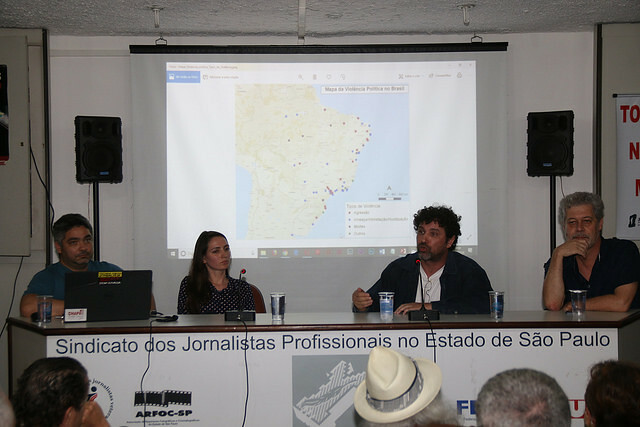 The organizations held a ceremony to release the map at the Union of Journalists of São Paulo. Journalist Patrícia Zaidan, one of the 804 people laid off by publisher Abril in August, took part in the event. “We are the outcome of the labor reform. After the reform passed, Abril struck a blow, fired 804 people, filed for reorganization, and didn’t pay anyone. This is how they treat workers everyday everywhere. This is why we have to overturn this reform,” she stated.